On a road trip miles from home, this anagram-happy, washed-up child prodigy has ten thousand dollars in his pocket, a bloodthirsty feral hog on his trail, and an overweight, Judge Judy-loving best friend riding shotgun–but no Katherines. Colin is on a mission to prove The Theorem of Underlying Katherine Predictability, which he hopes will predict the future of any relationship, avenge Dumpees everywhere, and finally win him the girl. I was enjoyed this book and would have given it 4 stars, except for the fact that they used the word ‘retarded’ to refer to someone. This is one of the things that I am COMPLETELY not okay with because I hate that word and it should NEVER be used as an insult. I do admit that I lost some respect for John Green after that because there were so many other ways to get his message across. This horrible word was used on pages: 66, 121, 122, 175 and 200 of the paperback edition, therefore I am taking off one star for that. I did enjoy quite a bit about this book aside from that. John Green is the quote master, I swear. He always has very quotable sentences or passages that just make you smile and agree. The act of leaning in to kiss someone, or asking to kiss them, is fraught with the possibility of rejection, so the person least likely to get rejected should do the leaning in or the asking. And that person, at least in high school heterosexual relationships, is definitely the girl. Think about it: boys, basically, want to kiss girls. Guys want to make out. Always… there’s rarely a time when a boy is thinking, “eh, I think I’d rather not kiss a girl today.” Maybe if a guy is actually, literally, on fire he won’t be thinking about hooking up. But that’s about it. Whereas girls are very fickle about the business of kissing. Sometimes they want to makeout; sometimes they don’t. They’re an impenetrable fortress of unknowability, really. okay I know that is a hecking long paragraph but I thought it was funny and noteworthy. There wasn’t a ton of plot to this book, but I don’t believe that parents would just let their overly protected children just leave on a road trip to who knows where without much convincing. I know at least MY parents wouldn’t and I’m 19, not 16. I just thought that wasn’t super plausible, but that also might be growing up with protective parents. Books are the ultimate Dumpees: put them down and they’ll sit for you forever; pay attention to them and they always love you back. True, John Green. I see you. I liked the message of this book that you shouldn’t strive to be remembered for something specific, just live life and people will remember what you did. I really liked that because it’s very true. I will get forgotten, but the stories will last. And so we all matter–maybe less than a lot, but always more than none. I think this is my least favorite John Green that I’ve read, but it wasn’t bad. I will still read what he publishes in the future. 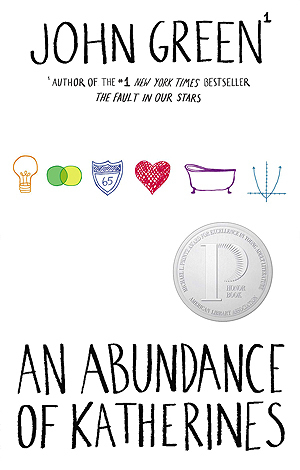 I liked the characters of this book, but they’re the same as every single John Green character lol. I feel like they’re all super randomly unique, but they’re all the same… I don’t know if that makes sense, but if you’ve read all of his books you’ll know. I’m glad I read this, and it’s funny to me that I read two JG books in one month. Turtles was definitely better.